The Toyota RAV4 was a concept born in 1989. The moniker RAV4 means Recreational Active Vehicle with 4-wheel drive. 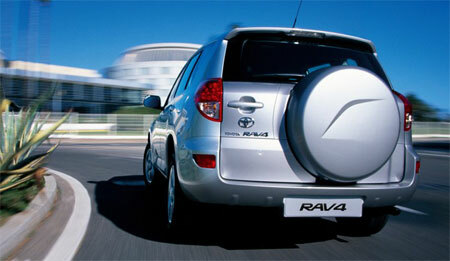 5 years later, the first Toyota RAV4 was launched at the 1994 Geneva Motor Show. UMW Toyota is now offering the third generation Toyota RAV4 on our local shores. The previous two Toyota RAV4 compact SUVs were commonly called RAV4.1 (top left) and RAV4.2 (top right). The Toyota RAV4.2 was available here in CBU form through either UMW Toyota or through grey importers. Both three-door and give-door versions were available. Let’s have a look at the third generation five-door 2006 Toyota RAV4, or the RAV4.3, which comes to Malaysia in CBU form. Internationally, the Toyota RAV4 is offered with 2.0 I-4, 2.4 I-4 and 3.5 litre V6 gasoline engines in most countries that are large-displacement friendly, as well as two 2.2 litre D4D turbodiesel offerings. 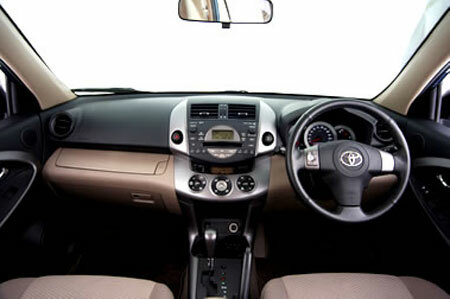 Our local CBU 2006 Toyota RAV4 comes with a 2.0 litre engine and an automatic transmission. At first glance, the new 2006 Toyota RAV4 looks like a face-lift of the previous second generation version, although it seems that it has gained weight abit, in the right proportions. It also gets a new snout shape flanked by projector headlamps which reminds me of the Scion tC Coupe. The new 2006 Toyota RAV4 is 145mm longer then it’s previous incarnation, and cabin length has been increased by 85mm. The distance between the front and rear seats has been increased by 55mm. The width has also been increased by 80mm. This will allow more comfortable seating of 3 adults at the rear seats. As a whole, the interior volume has increased by 13%. Newly developed rear suspensions with diagonal positioning of shock absorbers also allow more luggage room because of minimal wheel arch intrusion. This allows a 230mm increase in luggage room width, making a total luggage space increase of 47%. Maximum luggage capacity with the rear seats folded flat is 1,459 litres. The 2006 Toyota RAV4 is powered by a 2.0 litre VVT-i engine – the 1AZ-FE. 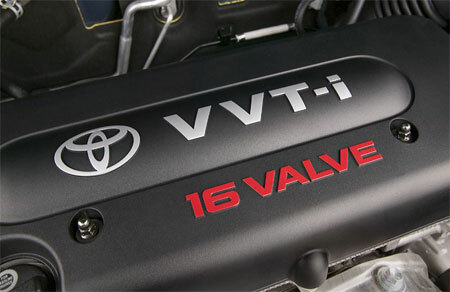 This powerplant is a 1,998cc 4-cylinder 16-valve DOHC electronic fuel injection engine featuring Toyota’s VVT-i variable valve timin technology for a smoother torque curve. The engine makes 152hp at 6,000rpm and 198Nm of torque at 4,000rpm, giving the 1,505kg car a nice spirited drive, though a 2.4 litre would be alot nicer. The only available transmission is a 4-speed Super ECT automatic, with Active Torque Control (ATC) 4 Wheel Drive. Active Torque Control automatically controls the transfer of torque between the front and rear wheels, allowing seamless changes from front-wheel drive to four-wheel drive whenever the additional traction is needed. Remaining in front wheel drive in situations where 4WD is not needed will improve fuel efficiency. The front suspensions are MacPherson Struts while the rear suspensions are trailing type double wishbones. Brakes are 16 inch ventilated discs at the front, and the rears are solid discs. The car rides on 225/65/R17H tyres wrapping nice 17 inch alloy wheels. The 2006 Toyota RAV4 gets a nice grey and silver and beige interior colour scheme, with a sporty 3-spoke leather-wrapped steering wheel. I personally would have preferred if it was dark grey, light grey and silver but as a premium SUV, it’s target market normally prefers some beige or cream in their interior. 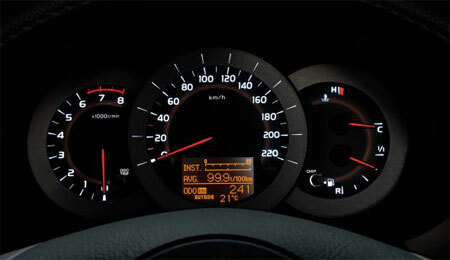 The dashboard meters are of the Optitron variety naturally, which self-illuminates, allowing for a clearer display with less glare. This eases the strain on the driver’s eyes. Air conditioning is a digital system with ample outlets, and there are even foot outlets for the rear passengers. The Audio System is a 2-DIN system that plays MP3 and WMA, and is hooked up to a 6-disc changer. It’s design complements the dashboard design, but since it is of the standard 2-DIN variety you can change it to a better player if you want. The audio system comes with 6 speakers standard. As with all Toyotas, the 2006 Toyota RAV4 has a GOA certified body. There is an abundance of airbags in this SUV, with dual front airbags and side airbags for the front row. There are also curtain shield airbags for the front and rear passengers. The driver also gets a special knee airbag. I told you there were plenty! Other than 4WD for improved traction, the car also has anti-lock brakes and electronic brakeforce distribution. The 2006 Toyota RAV4 is also equipped with Vehicle Safety Control (VSC) and Traction Control (TRC), down-hill assist control and hill-start assist control. Remember the Toyota Landcruiser VX commercial featuring Toyota’s down-hill assist? Being a CBU fully imported from overas, the new 2006 is certainly not cheap. But it’s a real Toyota world car, and has an impressive feature list. The 2006 Toyota RAV4 will cost you a whopping RM203,400.00 for individual private registration in Peninsular Malaysia. For those living in Langkawi and Labuan, it will cost you RM93,282.50.